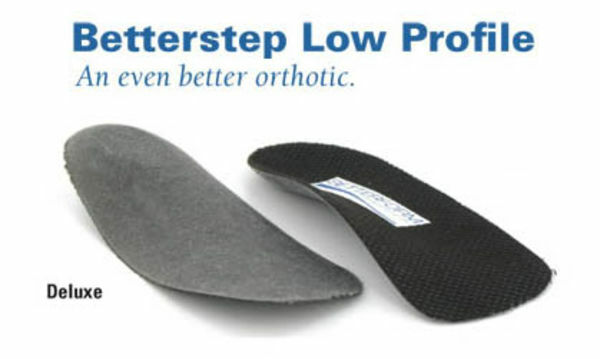 The Betterstep Low Profile Deluxe is an ultra thin, high quality orthotic. This is a lightweight and heat moldable orthotic and is ideal for use in dress shoes or shoes that don't have alot of room. Suitable to provide arch support to 95% of the population. Durable design that last for several years. Heat Moldable - please view the heat moldable instructions. Available Arch Assist to increase arch support and reposition the location of the arch. Betterform has been in the orthotic foot care business for more than 25 years and have developed a reputation as an industry leader. Their goal is to provide only the highest quality products and services with the patients health and well being in mind. View all Betterform items. I've worn these before & love them. Her thin but works great.